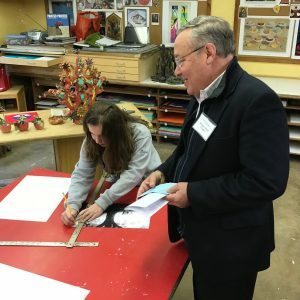 Yesterday, many of our Buckingham Friends School Trustees attended “Board Visiting Day.” This was an opportunity for them to tour the entire campus, to visit classes in action, and to witness first-hand the outstanding education that is provided each day here at BFS. 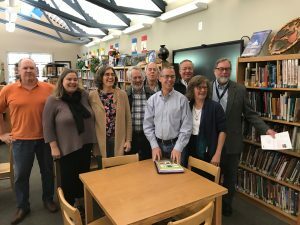 They were able to speak directly with the faculty me, and to engage with members of the administrative team about current matters and future initiatives in the areas of academics, admissions, finance, and fundraising. I am grateful for their time, stewardship, and the hard work and care they provide in support of BFS and as we chart the course for BFS’s future and long-term health and sustainability. I received the following notes from a few trustees, sharing their reflections after visiting classrooms. While individual teachers were noted, these observations speak to the quality and caliber of our entire faculty. I have included them below. “Thank you for the invitation for trustees to attend Board Visiting Day yesterday. It was a special day, and I felt very well cared for and welcomed by the faculty, staff, students, and the administrative team. In reflecting upon the day, I loved that you chose to begin our tour of the campus in the Meetinghouse, which for me, is the central Light in our school community. 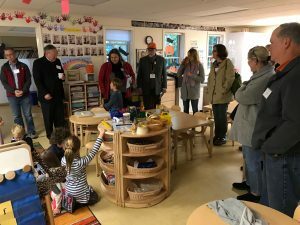 From the Meetinghouse, we ventured on our way to Lower School where we received a very warm welcome from students and faculty alike. I delightfully noticed the intention in which the faculty modeled a wonderful welcome for their trustee visitors. Upon our arrival to the kindergarten class, Grear, bravely greeted each trustee with a handshake and a brief connection with our eyes; the 1st grade class invited us to sing along with their “morning meeting song”. The culture of Buckingham Friends School fosters and models this welcoming and inclusive behavior for students, and in doing so, prepares and empowers BFS children with many essential life-skills – kindness, empathy, self confidence, and inclusion, among many others. As our day progressed, I visited a few classrooms during the open visitation time, and I found them all to be equally as lovely and nurturing. 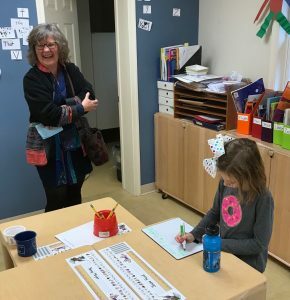 As I participated in the 3rd grade French class, I noticed the wonderful way in which Madame Bode engaged each and every student in her class – from the most excited student to the very shyest student. It was wonderful to see and feel the joy and excitement as the children participated fully in the class. I spent time with the 5th grade science class where students were learning about their new mapping project. I sat with a very enthusiastic and kind student who was super excited to show me his recent work. I felt so conflicted….should we be paying attention to Stephanie? Should I continue to listen to this sweet, young boy who was telling and showing me, with such pride and joy, about the work the class had completed last week? We did a little of both. “Thank you for inviting me to the Board Visiting Day. A lot has changed in a short amount of time, and I enjoyed walking with you and visiting all of the classes. I spent the bulk of my time in 2nd grade and in the Arts building in music – shop and art class. It’s great to have Kris back and all the special gifts she has to share with our children. 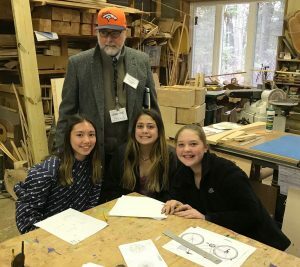 I am always impressed by the kids – especially the 8th graders, who split their time between art and shop today. One of my favorite times at BFS is the Art Show. I get to see the projects the kids have been working on. Today all of the kids were focused and really dialed into what Kris and Sydney were teaching, but at the same time, the kids were free to work on their projects. As you are aware, there was a capital campaign during my time at BFS in the late ‘70’s, which resulted in the completion of the Arts building in ‘79. I still remember George Rowe periodically painting what looked like a thermometer as we got closer to our goal of $300,000. Hard to believe the building is almost 40 years old! 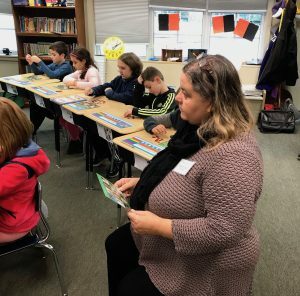 In the two 2nd grade classes, what seemed like chaos was quickly transformed by Dr. R and Juli as I witnessed the kids beginning to center and focus on the mathematics lessons. The children were very comfortable using their IPads for the lesson – a far cry from the chalkboards of my day. We are fortunate to have such gifted teachers and state-of-the-art technology. 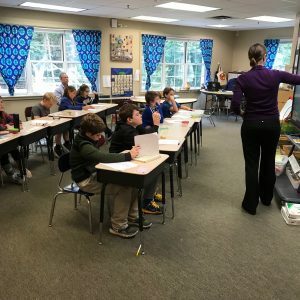 “I believe that one of the unique things that a Friends school can do is to be deeply attentive to instilling in our children an understanding of continuing revelation. 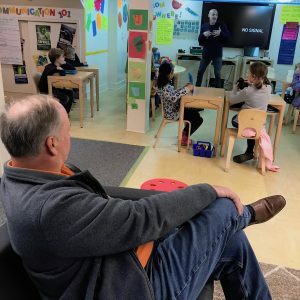 At our best, we model comfort with uncertainty, a determination to work through uncertainty together, and an uncompromising commitment to seeking truth, helping students to understand that this requires testing one’s own discoveries in community and listening deeply to the experiences and insights of others. I saw the belief in continuing revelation in action yesterday when Paul spoke in the Meetinghouse about how the community, while recognizing the power of the queries in Meeting for Worship, is thinking about other aspects of Meeting for Worship the community might experience more deeply if queries were not used in every Meeting for Worship. I saw it in 4th grade math, when Jennifer and Karen were very explicit in their work on multiplication of two digit numbers with the children that there is no single “right” way to do a problem and, while there are methods we can rely on (as well as things that don’t work! ), we come to understand the subject much more deeply if we develop the habit of studying methods used by friends that are different from our own. Why did or didn’t that work? What did it have in common with my approach? How does it connect to something else we know? I saw it in 8th grade English when Kara asked students to consider questions with “no right or wrong answers” but which require decisions. 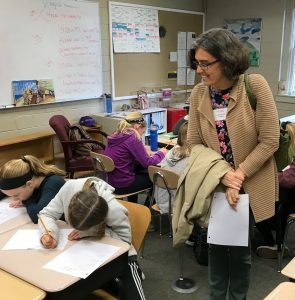 Though I only saw the beginning of the exercise on these questions, it was clear that the questions were ones whose complexities will help students come to see carefully listening to others’ responses can change our own perspectives. I saw it in 5th grade math when Lauren listened carefully to student voices in facilitating a consideration of strategies for deciphering mathematical notation and language. And so on . . . Thank YOU, one and all, for spending so much time at BFS yesterday. It was meaningful for all of us to have you on campus – especially the teachers and students, and I am grateful for your work to take in the whole school, to obverse classes in action, to engage in a conversation with me about a range of significant topics, and to share lunch and conversation with the admin council and one another. It is humbling to reflect on all that you are and do already, and it was again inspiring for me to witness your deep love and appreciation for all things BFS – for both your hard work and huge hearts really make the/a difference.